Hola! Things here in Bocas del Toro are going well. We have had many fish-related successes in the lab and the field. One of our more exploratory endeavors was to set out a light trap and do a plankton tow in the hopes of glimpsing some larval fish. I could go on and on, but you're better off hearing it from an expert who works on larval fishes: Heidi Block from California State University, Northridge. 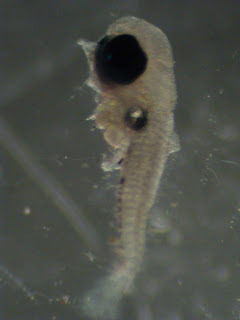 Heidi writes: Larval fish are incredibly small, often transparent and float around in large bodies of water; this makes them very difficult to study. One way to deal with this is to look at otoliths. Otoliths are calcium carbonate structures found in the ears of fish. Their function is to detect both sound and gravity however they also provide a history of an individual. They do this by the formation of daily rings, much like how trees form rings. Many species also have a settlement mark, which is a mark on the otolith formed when an individual leaves the plankton and joins a reef. Using the settlement mark and daily ring formation you can determine larval characteristics without having to deal with the difficulties related to working with larvae. By counting from the core of the otolith to the settlement mark you can determine the age at which a fish is settling on a reef, you can also determine growth rates during the larval stage by looking at the width of the daily rings, and in addition you can determine the size at which an individual settled onto the reef. Determining what is happening in the larval stage and how this influences individuals once they settle on the reef is an important step in understanding the population dynamics of reef fishes. This is an otolith from a temperate wrasse, Oxyjulis californica. The black line indicates the area on the otolith associated with the planktonic phase of this individual. The red line is the settlement mark and the blue line is the area associated with the time this individual spent on the reef. This is the last night of the course, so we're going to sign off and head home. The students are off to take their next course (Terrestrial Tropical Ecology), but we (Liz, Clare, Heidi and I) are headed home. We hope you've learned more about the Panama reefs, and fish in general, from this Expedition. Thanks for reading! !